I was asked to write a summary of the provincial Greens’ recent meeting in London, Ontario for the party’s monthly newsletter (PDF). Here it is. I think that our new leader Mike Schreiner said it best when describing the outcome of the Green Party of Ontario’s recent leadership conference and policy convention. “There’s a sense of a new beginning, and a new era in the party.” The momentum and energy coming out of our weekend in London was that of a party that has embraced a common vision and is hopeful and upbeat about the future. Green members from across the province met in London, Ontario from October 13th to 15th. While there were policy workshops and debates, most of the buzz was centered around celebrating outgoing leader Frank de Jong for his amazing 16-years of service, welcoming and affirming incoming leader Mike Schreiner and listening to and learning from great speakers from within and without the party. For me, three themes emerged: that we must be the party of hope and principled solutions, that we already have more influence and impact than we know, and that in order to reach new levels of success we’re going to have to get to work. To a certain extent, those three themes were encapsulated by three presentations. The first, by Schreiner. “Don’t appeal to fear when dealing with climate change,” he said during a town hall meeting on the Saturday, “even though fear is justified.” Instead, he said, focus on all of the great opportunities that will come out of transitioning our economy, for example. The second, by Markham City Councillor Erin Shapero, a non-partisan, who told us in an inspiring speech that “[Greens] have shone light that has shined brighter and reached further than you may realize. Thanks to your leadership things are trickling down and happening [in governments] in ways that you maybe haven’t imagined,” before predicting that there will be Green MPPs at Queen’s Park after the next election in 2011. In other words: stay positive, recognize the amazing things we’ve already done, and get to work on the incredible task ahead. Crossposted from my blog on gpo.ca, which has even more posts from this weekend’s convention. Leadership contestant Mike Schreiner spent 30 minutes this morning answering questions from Greens in attendance at this week’s convention. His comments were an inspiring and energizing call to action. What follows is my attempt to transcribe some of his comments. These are mostly direct quotes but some slight paraphrasing has taken place as well. First, you need to have the right vision. I joined the Green Party of Ontario because I absolutely believe we have the right vision. Third, we need to be able to effectively, clearly and compellingly deliver a message that motivates people to vote for us. I think our message needs to focus on three critically important pillars. The second critical component, we need to foster strong sustainable communities and empower our municipalities. Third, I’m going to be steadfast in my commitment to promoting the health and well being of all Ontarians. Question: How will you ensure we run strong candidates in all ridings? I think it’s absolutely critical that we run 107 candidates, and first we need to have 107 functioning CAs. I’m going to be a full time leader. That means I’m going to spend at least one day a week at Queen’s Park, and the other five days (I’d like to take one day a week to spend with my family) I’m going to be traveling around the province engaging voters and our members. I don’t want a candidate to go into the next election without the support of a CA in place. But I’m going to be frank with you. We’re going to need to focus our resources on ridings where we think we have a chance to win. And when we break through in one or two ridings it’s going to benefit every single riding and every single candidate across the province. Question: How will you ensure we’re not just preaching to the choir? I’m going to propose that we do a Community Engagement Program where CAs go out into the community and do something like support the local BIA or organize a Buy Local campaign or a Clean Up The River campaign. We need to demonstrate concretely on the ground that we as a party are doing things to benefit the community. We have to reach out to people who are not yet members of this party. The nice thing is I’m already getting quite a few requests to speak at events that aren’t Green party events. It’s going to take just picking up the phone and talking to business leaders, community leaders, NGOs, heritage associations, and opening a conversation with them. It’s going to take every single person in this room to engage and commit to that kind of activity. Climate change is an enormous problem, and we need to accomplish huge emissions reductions. How will we do that? First, don’t “appeal to fear” when dealing with climate change, even though fear is justified. Instead, talk about the opportunity to transition our economy. One of the things we have to address right away is the lack of efficiency in our buildings. We need an aggressive campaign to retrofit all our buildings. The great thing about that is it’s going to create hundreds of thousands of jobs. The other great thing is it’s actually going to save us money over time. The second opportunity is for each and every Ontarian to become an energy entrepreneur. The third critical area is around our transportation systems. Again, we can appeal to that in a positive way. “Did we bargain for this? Do most of us really want to spend three hours a day in our cars?” No, we want to spend time with our families. What is our position on the HST? We’re opposed to it, and I’d invite you to read Frank de Jong’s blog on the subject. Most parties have attacked this as a “tax grab,” and it is, but there’s a more fundamental issue with the HST, and that’s the continued centralization of power in this country. We’ve taken an important tool and turned it over to the federal government. (Ed Note: I’m definitely paraphrasing here.) We use taxation tools to help create the changes we need, so abdicating those tools to another government is not in the long term interest of the province. What motivates Green party activists isn’t the political appointment at the end of the day, it’s our commitment to our values, principals and vision to create a better world for our children. That, as Frank de Jong says, is our compass. Hey, we can have a Seinfeld convention too! In addition to electing a leader and some executive positions, we’ll be work-shopping and debating policy with a view to having a great platform in 2011. I believe that the Green Party of Ontario is poised to make some impressive gains in the provincial election that will take place at the end of that year. The Conservatives and the NDP have moved further to the ideological fringes, and the Liberals are getting badly battered by the kind of scandals that tend to happen when you’ve been in power too long. On the other hand, Greens are offering practical and needed solutions to the challenges our province faces, and voters are responding. I’ve been asked to provide updates throughout the weekend on behalf of the provincial Greens, so you can follow my blog on the party site here, as well as the official Twitter account @OntarioGreens. If I get ambitious and if the right moment presents itself I may even try out my new Flip video camera, but don’t get your hopes up too high. Friends, if you have any time today or tomorrow please lend a hand to Chris Chopik, the Green Party of Ontario’s candidate in the September 17th St. Paul’s by-election. A strong showing by Chris is a great way to send a message to other parties and to actually influence real change in Ontario politics, and these last 48 hours are critical. 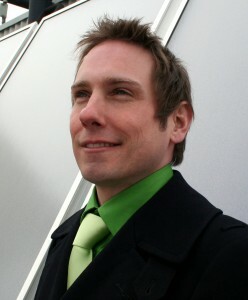 Chris Chopik is a Realtor and recognized leader in the green real estate movement in Canada. He has been featured in two Globe and Mail articles and two Toronto Star articles including a feature focusing on â€œGreen Heroesâ€. Chris has been called the â€œGreen Guruâ€ on Global News, and has appeared on Christina Chierneskyâ€™s House Calls, on Breakfast Television, and CBCâ€™s Metro Morning. Chris is not new to the world of politics. In 2008 and 2009, he advised the provincial government on housing-related aspects of Ontarioâ€™s new Green Energy Act. Chris has also worked with the City of Toronto and Torontoâ€™s ENGO community to create new opportunities for local engagement around environment and economy issues. He has publicly advocated for the advancement of a meaningful â€œgreen economyâ€ agenda, a smart electricity grid, renewable energies and a robust energy conservation policy. Within the riding of St. Paulâ€™s, Chris has consistently supported community development in the areas of local economy, urban agriculture, renewable energy and home energy efficiency. Chris is an active contributor to the Cedarvale Childrenâ€™s Garden, a board member of LEAF, the organizer and key sponsor of the Strawberries and Asparagus Festival, an advisor to Green Enterprise Toronto and an advisor to Green Neighbours 21 on their â€œGreen Togetherâ€ program. If you live in the GTA, show Chris your support in person and join us after the polls close for the Election Night Party, at Zemra Bar Lounge ( 778 St Clair Avenue West Toronto, ON M6C 1B6) starting at 7:00PM.